Click here to read Jonah Keri’s case for why the Red Sox will win. This Fall Classic is rife with historic undertones. The St. Louis Cardinals and Boston Red Sox will meet again in the World Series, as they did in 2004, as they did in 1967, as they did in 1946. Game 1: @ Boston, October 23, 8:07 p.m.
Game 2: @ Boston, October 24, 8:07 p.m.
Game 3: @ St. Louis, October 26, 8:07 p.m.
Game 4: @ St. Louis, October 27, 8:15 p.m.
Game 5*: @ St. Louis, October 28, 8:07 p.m.
Game 6*: @ Boston, October 30, 8:07 p.m.
Game 7*: @ Boston, October 31, 8:07 p.m.
Only, this meeting won’t be anything like nine years ago. Back then, the Cardinals were playing in the World Series for the first time in 17 years, hoping to win their first championship since 1982. But they were merely props in the best baseball story in decades, as the Red Sox had just completed an unprecedented comeback from a 3-0 series deficit against the Yankees in the ALCS and were trying to win their first championship in 86 years. Dave Roberts was already an instant legend. The Cardinals’ seven-game NLCS win against the Houston Astros remains the forgotten playoff drama of our generation, because the nation was too fixated on Reversing the Curse to notice. Things have changed, of course. The Red Sox won the World Series again in 2007. Pink hats sprouted from Cambridge to California. Fallon was picked to host The Tonight Show. The Cardinals, who won 105 games in 2004, won only 83 two years later — but took the NL Central by a hair and then won the World Series. In 2011, the Cardinals were 8½ games out of a playoff spot with barely three weeks left, but found themselves holding the wild card when the Braves collapsed, winning another World Series after being down to their final strike twice in Game 6. Both franchises have enjoyed more good fortune over the past decade than some teams experience in their history. And now they’re both back, on the brink of a death match for the right to be called the Team of the 21st Century. 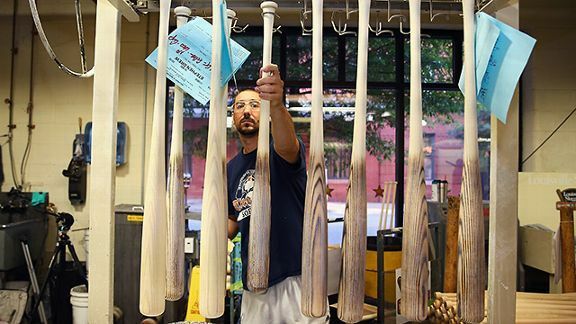 One of these clubs will win its third World Series of the century; the Yankees and Giants are the only other teams that have played in three World Series this century. It’s the Nation of Boston Strong vs. the Best Fans in Baseball, and, frankly, the rest of the country is sick of both sides. David Ortiz and Yadier Molina are still around as links to a more innocent past, but 2004 feels like a long time ago. It’s a pretty even matchup. But the Cardinals will win. Here are five reasons why. 1. The Cardinals’ pitching is currently the best it has been all year. Michael Wacha made nine starts during the regular season. He pitched very well, posting a 2.78 ERA as a rookie, but there’s only so much impact a player can make in 65 innings. 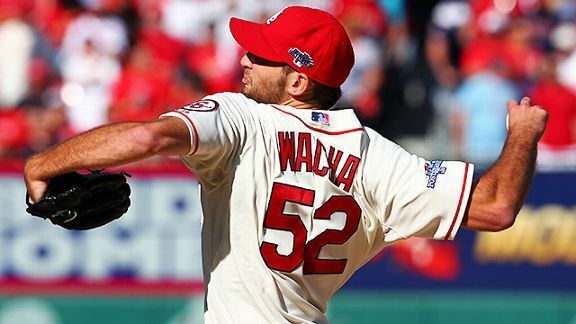 In the postseason, however, Wacha has emerged as an elite starting pitcher. After coming within one out of a no-hitter in his final start of the regular season, he took a no-hitter into the eighth inning in a must-win NLDS Game 4 against Pittsburgh. He then won both of his starts against the Dodgers in the NLCS without allowing a run. In his last four starts, he has allowed just nine runs in 30 innings … no, wait, nine hits in 30 innings, along with six walks, 31 strikeouts, and a single run. The bullpen, like the rotation, is better than a look at the regular-season statistics indicates. Trevor Rosenthal took over the closer’s job from Edward Mujica late in the year and has been dazzling: In seven postseason innings, Rosenthal has allowed three hits and no runs while striking out nine. The Cardinals won the World Series in 2006 and 2011 with closers (Wainwright and Jason Motte, respectively) who didn’t take over the job until September. Rosenthal didn’t become the closer until September, either, but given the Cardinals’ recent history, that’s not a concern. In fact, it’s starting to seem like it might be by design. Pitching in front of Rosenthal is fellow rookie Carlos Martinez, who threw just 28 innings with a 5.08 ERA during the regular season. Martinez came into the season as one of the top pitching prospects in the game, but was exclusively a starter in the minor leagues. He made one start for the Cardinals in August, but they transitioned him to relief in the majors with this goal in mind: having him serve as the eighth-inning bridge in the playoffs. He took the loss in Game 3 of the NLDS when he left the game with runners on first and second and one out, and both runners scored. But he has allowed just one hit and one walk combined in his other six outings. He pitched the eighth inning in all of them, and St. Louis won all of them. Among all major league pitchers who threw 25 innings this year, Martinez’s average fastball velocity of 97.6 mph ranks third; Rosenthal’s 96.4 average ranks eighth. This is the way to build a playoff pitching staff in 2013: two elite starting pitchers who can each throw seven innings, followed by a pair of flamethrowers to pitch the eighth and ninth. The Red Sox have as patient of an approach at the plate as any team in the game, but the Cardinals’ bullpen strength will negate some of that value. Boston’s strategy is to make the starting pitcher work in an attempt to get him out of the game early and feast on middle relievers, and it worked to perfection against the Tigers: The Red Sox couldn’t hit Max Scherzer, but they won both of his starts because they teed off on the relievers who followed him. The Cardinals aren’t the Tigers, though, nor are they the Rays, another team the Red Sox beat in part because of a shaky bullpen. The Cardinals have Martinez and Rosenthal and a plethora of situational guys whom Mike Matheny can call in the middle innings if need be (we haven’t even mentioned Kevin Siegrist and his 0.45 ERA). There won’t be much of a payoff for the Red Sox in this series if they force the starting pitcher from the game. That doesn’t mean the Cardinals aren’t happy to have Wainwright fresh to pitch Game 1, of course. Wainwright and Wacha will start four of the first six games, and unlike the Tigers, the Cardinals won’t have to panic when their aces exit. 2. 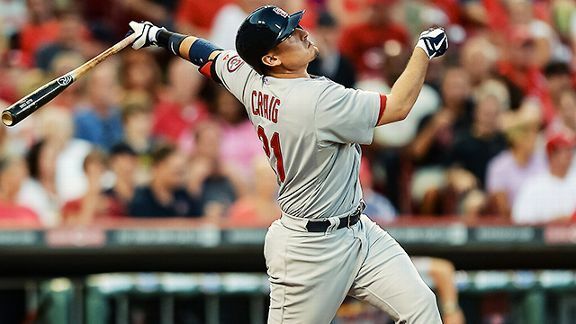 Allen Craig is returning just in time. Craig, the Cardinals’ starting first baseman, hit .315/.373/.457 this season, but suffered a Lisfranc injury in his left foot on September 4 and hasn’t played since. The injury typically takes six to eight weeks to heal; sure enough, the World Series begins exactly seven weeks after he went down, and Craig, who has been taking batting practice for the last week with promising results, looks poised to be the Cardinals’ DH in Game 1. Craig is an outstanding hitter, but he’s also the perfect embodiment of the Cardinals’ almost eerie success this season with runners in scoring position. The team batted .330 in those situations this year, 18 points higher than any other team since the dawn of play-by-play data around 1946. While the Cardinals’ collective skill set predisposes them to hitting for average in general — they were second to last in the NL in strikeouts and second in batting average (.269) — all the evidence we have suggests that hitting better with runners in scoring position is not a reproducible skill, which is a nice way to say that it’s probably luck. Last year, the Cardinals had a lower batting average (.264) with runners in scoring position than they did overall (.271). 3. 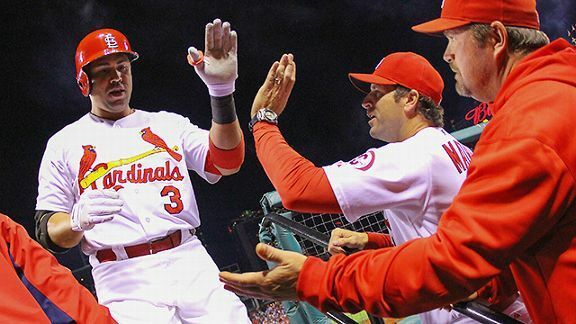 The Cardinals are as well-suited to playing with the DH as any National League team can be. 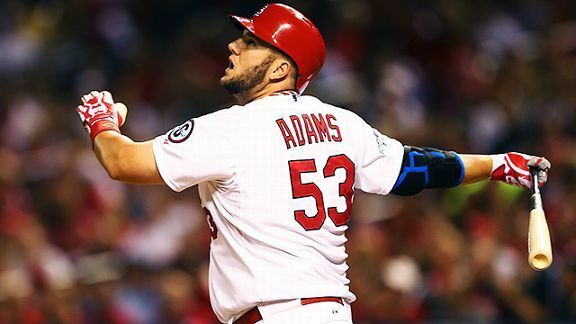 St. Louis has struggled all season to find playing time for beefy rookie Matt Adams, who hit .284/.335/.503 this year but couldn’t get on the field because the Cardinals already had Craig. And the club couldn’t move Craig to the outfield, because Matt Holliday and Carlos Beltran were entrenched at the corners. Adams’s presence meant that the Cardinals’ lineup didn’t suffer at all when Craig went down, but it left them with one of the weakest benches an NL playoff team can field. Shane Robinson was their only bench player with a .300 OBP. When Daniel Descalso started at shortstop, Robinson was also their only bench player with a .300 slugging average. When Shane Robinson is a team’s best bench player, that team has a terrible bench, and that remains true even though Robinson hit a pinch-hit homer in Game 4 of the NLCS and a two-run single in the deciding Game 6. This presents all sorts of problems when pitchers have to bat, and even more so considering St. Louis is forced to choose between two inadequate shortstops in Descalso and Pete Kozma. The Cardinals’ lineup goes seven deep, but the last two spots have been a hazmat zone. In the games at Fenway Park, however, Craig will be able to DH, giving the Cardinals eight above-average hitters in the lineup and cutting their offensive holes in half. Not that the Red Sox will protest; they’d rather field their optimal lineup than have a pitcher bat. Still, the Cardinals will hardly be at a disadvantage when they’re forced to use a DH. And in the three games at Busch Stadium, Craig’s return will give the Cardinals one “get out of jail free” card to use in a key situation. 4. The Cardinals don’t strike out, and in recent years, teams that don’t strike out don’t lose in the playoffs. Trying to find the magic formula for postseason success has been the sabermetric community’s version of trying to turn lead into gold: Many have tried, but none have entirely succeeded. Nate Silver came close, publishing an analysis of playoff results in the Baseball Prospectus book Baseball Between the Numbers in 2006. Silver found that three factors had an outsize effect on a team’s playoff performance: the pitchers’ strikeout rate, the quality of the closer, and the quality of the defense. While Silver’s “secret sauce” formula worked very well in predicting playoff outcomes historically, it has been no better than a coin flip at predicting the winner since it was released. Given the difficulty of finding any factors that correlate with playoff success, it’s worth holding on to any glimmer of hope. That makes the Sheehan Theory worth monitoring. Before the postseason, my podcast partner Joe Sheehan noted that since 2009, about the time strikeout rates spiked throughout baseball, the team that struck out fewer times during the season won 22 of 28 playoff series. So far this October, the team with the better strikeout rate has won four of six series, meaning the team that makes more contact has gone 26-8 over the past five postseasons. This might be a fluke, but given how much the strikeout has taken over the game — strikeouts are 35 percent more common than in 1992 and 21 percent more common than they were just eight years ago — it stands to reason that putting the ball in play, particularly against elite power pitchers on playoff teams, is half the battle. Winning that half of the battle is the Cardinals’ entire offensive philosophy. Despite playing in the league where pitchers bat, the Cardinals had 198 fewer strikeouts than the Red Sox. The Cardinals don’t hit a ton of homers — just two NL teams hit fewer — but they led the league in runs scored anyway, because they spray line drives all over the place. Four qualifying Cardinals hit .300 or better; only eight batters hit that mark in the rest of the NL combined. The Cardinals faced Clayton Kershaw, the best pitcher in baseball, twice in the NLCS, and limited him to just five strikeouts in each start. They put the series away in the third inning of Game 6, scoring four runs off Kershaw on a double and four ground ball singles. If the Cardinals can put together a sustained rally off of Kershaw, there isn’t a pitcher alive against whom they can’t dink and dunk their way to a multi-run inning. Last year, the San Francisco Giants had an eerily similar offense, one that produced the fewest homers in the league but also the second-fewest strikeouts. The Giants won the World Series. Maybe it’s a coincidence. Maybe it’s not. 5. The Cardinals have Carlos Beltran; the Red Sox do not. Ortiz has as many big postseason hits as any player in history, and he had another one in the ALCS, hitting the game-tying grand slam in the eighth inning of Game 2. But that swing of the bat was the sum total of his contributions: Ortiz was just 1-for-21 in his other at-bats, and he hit .091/.200/.227 in the series. Ortiz’s career numbers in the postseason are excellent (.272/.383/.516), but still below his regular-season numbers. This isn’t a surprise: The pitching is better in the playoffs, and all of the off days mean never facing a fifth starter or a mop-up man. October conspires to limit scoring. Except, that is, with Beltran, who has never delivered a bad playoff series. Ignoring the one-game wild-card “series” last year, Beltran has played in eight playoff series. In the first seven, Beltran posted an OBP of at least .500 or a slugging average of at least .600 in all of them. He failed to reach either mark for the first time in this NLCS, but still managed to hit .286/.423/.476, leading the Cardinals in all three categories. We’ll spare you the psychoanalysis of why a (thankfully dwindling) section of baseball fans consider Beltran a postseason failure. For now, it’s worth pondering once again that in 45 postseason games, Beltran has hit .337/.449/.724 with 16 homers. In 41 postseason games, Babe Ruth hit .326/.467/.744 with 15 homers. Anything can happen in a best-of-seven series, but the Cardinals have the edge. They can go toe-to-toe with the Red Sox offensively, they have a better one-two punch in the rotation, their deep bullpen mitigates the Red Sox’s strategy at the plate, they may boast the secret weapon for postseason success with their high-contact approach, and they field the greatest postseason performer of his generation. That’s enough to swing the series their way. The Cardinals’ followers better be the Best Fans in Baseball, because they’re about to become the Most Spoiled. The other two were the 1980 U.S. Olympic hockey team and the 1999 U.S. Women’s Soccer Team, both of whom represented something much bigger than themselves. Once again, the canard that pitching is more important than offense in the playoffs has proven false. Once again, a large segment of the public — and the media — will ignore this proof.